Syretta Hill, Executive Director of StepUp Durham, trains people on how to obtain and maintain employment. Her guilty pleasure is binge-watching TV shows and fun fact...she has been sky diving! Everything hinges on employment. That is a quote that one of our Employment Counselors made over one year ago, and it has stuck with me. I came to StepUp after 8 years of working for Habitat for Humanity of Wake County. When I started at Habitat, I was working with individuals. By the time I left the organization, I was leading an initiative that focused on communities. From my work, I was able to observe many communities and households, predominately communities of color, with employment challenges. Even some of our Habitat families, though now living in affordable and decent housing, still struggled from paycheck to paycheck. I met StepUp’s former CEO at a racial equity retreat. With a StepUp in Raleigh and Greensboro, he was looking to launch a Durham site. He wanted to create something different, an organization that had been invited into the community serving from a racial equity and asset-based approach. His description of what would become StepUp Durham resonated with me both personally and professionally. StepUp Durham, which focuses on employment training and placement for those with challenges to employment, opened its doors in October 2015. I was introduced to Rob even before we facilitated our first workshop. With a small team, 4 full-time staff and 4 interns, we were looking for a way to have a community presence and impact beyond our staff and financial capacity. Since joining the ReCity collaborative, we have exceeded our expectations. Our first win came in 2016, when we were able to work with Partners for Youth Opportunity (PYO) to help provide employment training. They, in turn, were able to focus on placing and sustaining their youth’s summer employment. We hope to expand this partnership to serve more youth this summer. Our second success has been with Helius. Some of our graduates come to StepUp with the passion to start their own business because they have significant challenges in finding traditional employment opportunity. Though StepUp Ministries, our sister organization with a 27 year history in Raleigh, has an entrepreneurship program for this population, we knew we did not have the resources to offer this service. By being in the ReCity collaborative, we have been able to use our limited resources to concentrate on core programming and send entrepreneurs to Helius, an organization focused on necessity-driven entrepreneurship. We are working on the expansion of this relationship as well, with Helius serving as a partner on our efforts to engage the Latino population in our work. Project Build has been a significant partner, referring their clients to our workshop. We have trained Michelle’s team, and they continue to help us think through ways to broaden the scope of who we serve in Durham. And in April, we will launch the next phase of our work called Step2 with another ReCity partner, REAL Durham. We believe that everything hinges on employment. We have been able to extend our reach in the 18 months since we opened our doors to the employment of youth, gang members and entrepreneurs. ReCity has allowed us to have a larger footprint in the community. If an organization is able to make your work more effective and efficient, it makes sense to partner. ReCity has done that and much more for StepUp Durham. 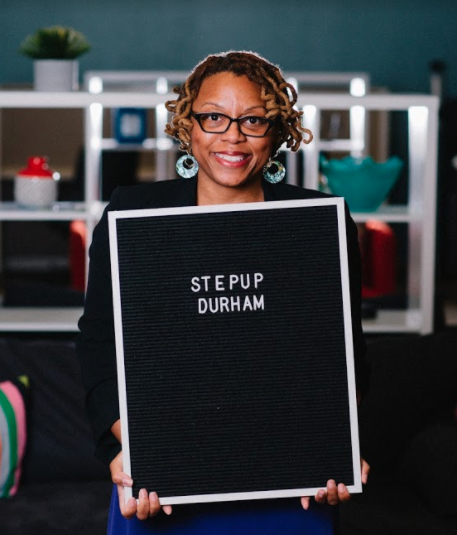 Learn more about StepUp Durham and our mission here!